Staff from Scotmid completed one of the Society’s biggest ever fundraisers when they entered the Ride Across Britain bike challenge. Colin McLean, Colin Hunter, Craig Duncan, Ian Lovie, Jim Harper, Martin Devlin and Paul Feeney rode from Land’s End to John O’ Groats between 8 and 16 September 2012. Their tremendous efforts have helped to raise thousands of pounds for Maggie’s Cancer Caring Centres. The seven colleagues, of varying cycling experience, trained for months in order to be fit for the challenge. This involved many cycle training days eventually building up to cycling 200 miles every training session. The total distance the team rode was 960 miles. They set off from Lands End on 8 September. After having encountered numerous trials and tribulations such as punctures, falls, and severe weather on the trip, they arrived at John O’Groats on Sunday 16 September to a pipe band piping in all the riders, and local residents cheering them on. On Thursday 13 September, the riders were given a rapturous reception from some of their Scotmid colleagues who had gathered at the overnight stop at Hamilton Racecourse. 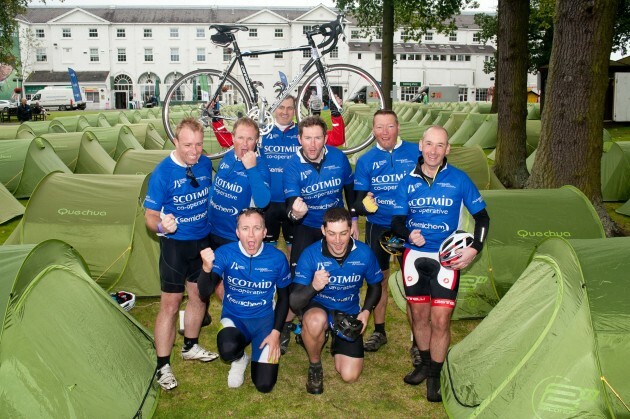 The team also stopped at some Scotmid and Semichem stores along the route for short breaks. After hours in the saddle, the faces of some of their store colleagues was a welcome sight. On some days the team spent up to 12 hours on their bikes. At their last pit stop at the Society’s Semichem branch in Thurso, the team were bowled over when they were told that staff at the store had raised £4000 to support the team. Despite having rode all the way through the UK in sometimes adverse weather conditions they were still fresh faced and in good spirits. They showed great dedication to the challenge and some are already thinking of the next challenge. Although that won’t be until they have had a well earned break.